Despite the abstract format of this discourse, it deals with an emotional topic: the source of emotions, the use of the emotions in the course of the practice, and the ideal emotional state of a person who has completed the path and is fit to teach others. In particular, this discourse counters a common misperception: that the distress that comes from having an unachieved goal is an obstacle in the practice, and that the antidote for that distress is to renounce any sense of goals. In actuality, that distress — termed “renunciation distress” — has an important role in the practice: to overcome the distress that comes with a sense of loss over sensual pleasures that have not been attained, or those that have been attained in the past but now no longer exist. Renunciation distress serves as a reminder that the loss of sensual pleasures is not a serious matter. As for renunciation distress, it is overcome, not by abandoning any sense of goal, but by following the path and realizing the joy that comes when the goal is reached. This discourse counters another misperception as well: that equanimity is the goal of the practice. In actuality, renunciation equanimity serves a function as part of the path of practice — as a tool for letting go of renunciation joy — and then it, too, is transcended by the state called “non-fashioning” (atammayata), in which there is no act of intention, not even the intention underlying equanimity, at all. The Blessed One said: “The six internal sense-media should be known. The six external sense-media should be known. The six classes of consciousness should be known. The six classes of contact should be known. The eighteen explorations for the intellect should be known. The thirty-six states to which beings are attached  should be known. With regard to them, depending on this, abandon that. There are three frames of reference that a noble one cultivates, cultivating which he is a teacher fit to instruct a group. Among master trainers, he is said to be the unexcelled trainer of those people fit to be tamed. This is the summary of the analysis of the six sense-media. “‘The six internal sense-media should be known’: thus was it said. And in reference to what was it said? The eye-medium, the ear-medium, the nose-medium, the tongue-medium, the body-medium, the intellect-medium. ‘The six internal sense-media should be known’: thus was it said. And in reference to this was it said. “‘The six external sense-media should be known’: thus was it said. And in reference to what was it said? The form-medium, the sound-medium, the aroma-medium, the flavor-medium, the tactile-sensation-medium, the idea-medium. ‘The six external sense-media should be known’: thus was it said. And in reference to thus was it said. “‘The six classes of consciousness should be known’: thus was it said. And in reference to what was it said? Eye-consciousness, ear-consciousness, nose-consciousness, tongue-consciousness, body-consciousness, intellect-consciousness. ‘The six classes of consciousness should be known’: thus was it said. And in reference to thus was it said. “‘The six classes of contact should be known’: thus was it said. And in reference to what was it said? Eye-contact, ear-contact, nose-contact, tongue-contact, body-contact, intellect-contact. ‘The six classes of contact should be known’: thus was it said. And in reference to this was it said. “‘The eighteen explorations for the intellect should be known’: thus was it said. And in reference to what was it said? Seeing a form via the eye, one explores a form that can act as the basis for happiness, one explores a form that can act as the basis for unhappiness, one explores a form that can act as the basis for equanimity. Hearing a sound via the ear … Smelling an aroma via the nose … Tasting a flavor via the tongue … Feeling a tactile sensation via the body … Cognizing an idea via the intellect, one explores an idea that can act as the basis for happiness, one explores an idea that can act as the basis for unhappiness, one explores an idea that can act as the basis for equanimity. The eighteen explorations for the intellect should be known’: thus was it said. And in reference to this was it said. “‘The thirty-six states to which beings are attached should be known’: thus was it said. And in reference to what was it said? Six kinds of household joy & six kinds of renunciation joy; six kinds of household distress & six kinds of renunciation distress; six kinds of household equanimity & six kinds of renunciation equanimity. “‘The thirty-six states to which beings are attached should be known’: thus was it said. And in reference to this was it said. “‘With regard to them, depending on this, abandon that’: thus was it said. And in reference to what was it said? “Here, by depending & relying on the six kinds of renunciation joy, abandon & transcend the six kinds of household joy. Such is their abandoning, such is their transcending. By depending & relying on the six kinds of renunciation distress, abandon & transcend the six kinds of household distress. Such is their abandoning, such is their transcending. By depending & relying on the six kinds of renunciation equanimity, abandon & transcend the six kinds of household equanimity. Such is their abandoning, such their transcending. “By depending & relying on the six kinds of renunciation joy, abandon & transcend the six kinds of renunciation distress. Such is their abandoning, such is their transcending. By depending & relying on the six kinds of renunciation equanimity, abandon & transcend the six kinds of renunciation joy. Such is their abandoning, such their transcending. “There is equanimity coming from multiplicity, dependent on multiplicity; and there is equanimity coming from singleness, dependent on singleness. “And what is equanimity coming from multiplicity, dependent on multiplicity? There is equanimity with regard to forms, equanimity with regard to sounds…smells…tastes…tactile sensations [& ideas: this word appears in one of the recensions]. This is equanimity coming from multiplicity, dependent on multiplicity. “And what is equanimity coming from singleness, dependent on singleness? There is equanimity dependent on the dimension of the infinitude of space, equanimity dependent on the dimension of the infinitude of consciousness… dependent on the dimension of nothingness… dependent on the dimension of neither perception nor non-perception. This is equanimity coming from singleness, dependent on singleness. “By depending & relying on equanimity coming from singleness, dependent on singleness, abandon & transcend equanimity coming from multiplicity, dependent on multiplicity. Such is its abandoning, such its transcending. “By depending & relying on non-fashioning,  abandon & transcend the equanimity coming from singleness, dependent on singleness. Such is its abandoning, such its transcending. “‘Depending on this, abandon that’: thus was it said. And in reference to this was it said. “‘There are three frames of reference that a noble one cultivates, cultivating which he is a teacher fit to instruct a group’: thus was it said. And in reference to what was it said? “There is the case where the Teacher — out of sympathy, seeking their well-being — teaches the Dhamma to his disciples: ‘This is for your well-being, this is for your happiness.’ His disciples do not listen or lend ear or apply their minds to gnosis. Turning aside, they stray from the Teacher’s message. In this case the Tathagata is not satisfied nor is he sensitive to satisfaction, yet he remains untroubled, mindful, & alert. This is the first frame of reference that a noble one cultivates, cultivating which he is a teacher fit to instruct a group. “Furthermore, there is the case where the Teacher — out of sympathy, seeking their well-being — teaches the Dhamma to his disciples: ‘This is for your well-being, this is for your happiness.’ His disciples listen, lend ear, & apply their minds to gnosis. They do not turn aside or stray from the Teacher’s message. In this case the Tathagata is satisfied and is sensitive to satisfaction, yet he remains untroubled, mindful, & alert. This is the third frame of reference that a noble one cultivates, cultivating which he is a teacher fit to instruct a group. “‘There are three frames of reference that a noble one cultivates, cultivating which he is a teacher fit to instruct a group’: thus was it said. And in reference to this was it said. “‘Among master trainers, he is said to be the unexcelled trainer of those people fit to be tamed’: thus was it said. And in reference to what was it said? “Steered by the elephant trainer, the elephant to be tamed runs in only one direction: east, west, north, or south. Steered by the horse trainer, the horse to be tamed runs in only one direction: east, west, north, or south. Steered by the ox trainer, the ox to be tamed runs in only one direction: east, west, north, or south. “But steered by the Tathagata — worthy and rightly self-awakened — the person to be tamed fans out in eight directions. “Possessed of form, he/she sees forms. This is the first direction. “Not percipient of form internally, he/she sees forms externally. This is the second direction. “He/she is intent only on the beautiful. This is the third direction. “With the complete transcending of perceptions of [physical] form, with the disappearance of perceptions of resistance, and not heeding perceptions of diversity, [perceiving,] ‘Infinite space,’ he/she enters and remains in the dimension of the infinitude of space. This is the fourth direction. “With the complete transcending of the dimension of the infinitude of space, [perceiving,] ‘Infinite consciousness,’ he/she enters and remains in the dimension of the infinitude of consciousness. This is the fifth direction. “With the complete transcending of the dimension of the infinitude of consciousness, [perceiving,] ‘There is nothing,’ he/she enters and remains in the dimension of nothingness. This is the sixth direction. “With the complete transcending of the dimension of nothingness, he/she enters and remains in the dimension of neither perception nor non-perception. This is the seventh direction. “With the complete transcending of the dimension of neither perception nor non-perception, he/she enters and remains in the cessation of perception and feeling. This is the eighth direction. “Steered by the Tathagata — worthy and rightly self-awakened — the person to be tamed fans out in eight directions. Satta-pada. The question in translating this compound is whether satta means “living being” or “attached to.” In this translation, I have opted for both. A person who “has not conquered his limitations or the results of action”: this passage seems related to the passage in AN 3.99, which defines a person of limited mind, prey to the results of past bad actions, as one who is “undeveloped in contemplating the body, undeveloped in virtue, undeveloped in concentration, and undeveloped in discernment; restricted, small-hearted, dwelling with suffering.” AsAN 3.99 points out, such a person suffers more intensely from the results of past unskillful actions than does one whose awareness is unrestricted. SN 42.8recommends the practice of the four sublime attitudes as a way of developing an unrestricted awareness that weakens the results of past unskillful actions. A person who is “blind to danger” is one who does not see the drawbacks of sensual pleasure or attachment to the body. For such a person, moments of equanimity are usually a dull spot in the midst of the quest for sensual pleasure. This is why such moments do not go beyond the sensory stimulus that generated them. Atammayata. Literally, “not-made-of-that-ness.” See the introductions to sectionsII/B and III/G in The Wings to Awakening. Speaking at the inaugural session of the regional consultation on electoral reforms here, she suggested that the entire poll expenses be borne by the government of India. State funding, she argued, would help to cure the evils plaguing the electoral system, including criminalisation of politics. She also called for a law to end criminalisation of politics, but wanted safeguards to prevent its misuse. Ms. Mayawati made her suggestions shortly after Union Law and Justice Minister M. Veerappa Moily and Chief Election Commissioner S.Y. Quraishi said that if electoral reforms made headway in Uttar Pradesh, one-sixth of India, the rest of the country would follow. As for defections, Ms. Mayawati said experience had shown that the anti-defection law lacked teeth. Defections flourished under the garb of “merger,” which she termed a cruel joke on voters. Those charged under the anti-defection law should be disqualified from contesting elections for five years. Given that her Bahujan Samaj Party was at the receiving end after its MLAs switched sides in 1997 and 2003, she said the Speaker usually pronounced an unsatisfactory ruling. “If an MP or MLA shifts political loyalty, he should be asked to resign and seek re-election on the symbol of the party he intended to join. But if the defection is for political gains, his membership of either House should be terminated by the Election Commission and a re-poll ordered. It is criminal to defect,” she said. Ms. Mayawati said reforms would be incomplete if the Dalits, the poor and the downtrodden were unable to exercise their franchise without fear. Mr. Moily said the reforms would address the needs of the common man so that his voice could be heard. From 156 million voters in the first general election to 750 million voters in the last election, India stood the test of time. However, he was unhappy that that compared with illiterate voters, literate voters, numbering 25 crore, did not tend to vote. Elections, he said, were an act of faith in the Republic and the Constitution. Mr. Moily said the ongoing regional consultations, which would be followed by a national consultation in Delhi on April 2 and 3, would help evolve consensus on areas of concern. Mr. Quraishi said persons with a criminal background contesting the elections had become a common phenomenon, and a legal answer was no solution as it “took 25 to 30 years for a person’s conviction.” A candidate charge-sheeted by a court should be debarred from contesting. He lauded Ms. Mayawati for having announced that her party ticket would not be given to candidates with criminal antecedents. The transfer of officials should be finalised six months before election dates, and if they were to be transferred after that, the Commission should be consulted by the government. Victimisation of officers by the next government should also be brought to the Commission’s notice. GLOBAL FINANCE is a fascinating, interdisciplinary interpretation of the volatile worlds of global finance and international trade. Discussing the sheer scope, power, and social and economic effects of global finance. Capital markets are now valued at an estimated $83 trillion. They exist within a system based purely on self-interest, in which herd behaviour, often based on rumours, can inflate or destroy the value of companies - or whole economies - in a matter of hours. Speaking stirringly of the nature of perception, illusion, and awakenment. , “Release your attachment to something that is not there in reality, but is a perception,” it is easily referred to 401(k) investments. “Release your attachment to something that is not there in reality, but is a perception,” it is easily referred to 401(k) investments. Players in the global financial networks have seemingly had little use for this philosophy. It is demonstrated that, seen through a such a lens, the exuberance of global financial wealth is illusory, divorced from the objective reality: the very real human suffering created by deals made on trading floors and in boardrooms invisible to most of us. Although they approach the questions from different perspectives, their interpretations overlap quite a bit: the value of material wealth, and one’s experience of reality, is subjective. And, crucially, desire plays a decisive role in both daily life and neoliberal economics. As the awakening discussion unfolds an important question is raised: can this profit at-all-costs mentality lead to a compassionate, humane economy, in which wealth is distributed more fairly? And how can an understanding of the fleeting and illusory nature of finance and consciousness help us develop alternative approaches? 153 LESSON 30 01 2011 Devadaha Sutta At Devadaha FREE ONLINE eNālandā Research and Practice UNIVERSITY to VOTE for BSP ELEPHANT for Social Transformation and Economic Emancipation to attain Ultimate Bliss-POLITICS IS SACRED with GOOD GOVERNANCE-VOICE OF SARVAJAN-HONEYLEAKS-Food Freedom Betrayal! In this sutta, the Buddha refutes the theories of the Jains — here called the Niganthas — an order of contemplatives flourishing in India during his time. Although on the surface this sutta may seem to be of strictly historical interest, it makes two important points that are very relevant to some common misunderstandings about Buddhism alive today. The first point concerns the Buddhist teaching on action, or kamma (karma). The general understanding of this teaching is that actions from the past determine present pleasure and pain, while present actions determine future pleasure and pain. Or, to quote a recent book devoted to the topic, “Karma is the moral principle that governs human conduct. It declares that our present experience is conditioned by our past conduct and that our present conduct will condition our future experience.” This, however, does not accurately describe the Buddha’s teaching on karma, and is instead a fairly accurate account of the Nigantha teaching, which the Buddha explicitly refutes here. As he interrogates the Niganthas, he makes the point that if all pleasure and pain experienced in the present were determined by past action, why is it that they now feel the pain of harsh treatment when they practice asceticism, and no pain of harsh treatment when they don’t? If past action were the sole determining factor, then present action should have no effect on their present experience of pleasure or pain. In this way, the Buddha points to one of the most distinctive features of his own teaching on kamma: that the present experience of pleasure and pain is a combined result of both past and present actions. This seemingly small addition to the notion of kamma plays an enormous role in allowing for the exercise of free will and the possibility of putting an end to suffering before the effects of all past actions have ripened. In other words, this addition is what makes Buddhist practice possible, and makes it possible for a person who has completed the practice to survive and teach it with full authority to others. For more on these points, see the articles, “Karma,” “A Refuge in Skillful Action,” and “Five Piles of Bricks“; see also the Introduction to The Wings to Awakening, along with the introductions to the sections on Skillfulness and Kamma & the Ending of Kamma in that book. The second important point touched on in this sutta — how to put an end to pain and suffering — relates to the first. If the cause of present suffering were located exclusively in the past, no one could do anything in the present moment to stop that suffering; the most that could be done would be to endure the suffering while not creating any new kamma leading to future suffering. Although this was the Jain approach to practice, many people at present believe that it is the Buddhist approach as well. Meditation, according to this understanding, is the process of purifying the mind of old kamma by training it to look on with non-reactive equanimity as pain arises. The pain is the result of old kamma, the equanimity adds no new kamma, and thus over time all old kamma can be burned away. The Buddha then provides his own account of how meditation actually works in putting an end to pain and suffering. His discussion shows that the problem underlying pain is not past action, but passion — in the present — for the causes of pain. In other words, pain is not inevitable. Present suffering can be prevented by changing one’s understanding of, and attitude toward, the cause of suffering in the present. The Buddha illustrates this principle with the simile of a man in love with a woman: As long as he feels passion for her, he will suffer when he sees her enjoying the company of another man; when, seeing the connection between his suffering and his passion, he abandons that passion, he will no longer suffer from that cause. Thus the practice must focus on ways to understand and bring about dispassion for the causes of stress and pain here and now. As the Buddha points out in MN 106, equanimity plays an important role in this practice, but it can also become an object for passion and delight, which would then stand in the way of true release. Thus he notes here that, in some cases, dispassion can arise simply from on-looking equanimity directed at the causes of stress. In other cases, it can come only through exertion: the mental effort — through the fabrications of directed thought, evaluation, and perception — to develop the discernment needed to see through and abandon any and all passion. The remainder of the sutta is devoted to a standard map of how the practice develops over time, showing how the proper mixture of on-looking equanimity combined with fabrication and exertion can lead to dispassion, and through dispassion to release from all stress and suffering. Queen Māyā’s white elephant dream, and the conception of the Buddha.Gandhara, second-third century C.E. .The birth of Siddhārtha, Gandhara, second-third centuryC.E. The Blessed One said, “Monks, there are some priests & contemplatives who teach in this way, who have this view: ‘Whatever a person experiences — pleasure, pain, or neither pleasure nor pain — all is caused by what was done in the past. Thus, with the destruction of old actions through asceticism, and with the non-doing of new actions, there will be no flow into the future. With no flow into the future, there is the ending of action. With the ending of action, the ending of stress. With the ending of stress, the ending of feeling. With the ending of feeling, all suffering & stress will be exhausted.’ Such is the teaching of the Niganthas. “When this was said, I said to the Niganthas, ‘Friend Niganthas, there are five things that can turn out in two ways in the here-&-now. Which five? Conviction, liking, unbroken tradition, reasoning by analogy, & an agreement through pondering views. These are the five things that can turn out in two ways in the here-&-now. That being the case, what kind of conviction do you have for your teacher with regard to the past? What kind of liking? What kind of unbroken tradition? What kind of reasoning by analogy? What kind of agreement through pondering views?’ But when I said this, I did not see that the Niganthas had any legitimate defense of their teaching. “‘If it were the case that when there was fierce striving, fierce exertion, you felt fierce, sharp, racking pains from harsh treatment; and when there was no fierce striving, no fierce exertion, you still felt fierce, sharp, racking pains from harsh treatment, then — that being the case — it would be proper for you to assert that, “Whatever a person experiences — pleasure, pain, or neither pleasure nor pain — all is caused by what was done in the past. Thus, with the destruction of old actions through asceticism, and with the non-doing of new actions, there will be no flow into the future. With no flow into the future, there is the ending of action. With the ending of action, the ending of stress. With the ending of stress, the ending of feeling. With the ending of feeling, all suffering & stress will be exhausted.” But because when there is fierce striving, fierce exertion, you feel fierce, sharp, racking pains from harsh treatment; and when there was no fierce striving, no fierce exertion, you feel no fierce, sharp, racking pains from harsh treatment, then — that being the case — it is not proper for you to assert that, “Whatever a person experiences — pleasure, pain, or neither pleasure nor pain — all is caused by what was done in the past. Thus, with the destruction of old actions through asceticism, and with the non-doing of new actions, there will be no flow into the future. With no flow into the future, there is the ending of action. With the ending of action, the ending of stress. With the ending of stress, the ending of feeling. With the ending of feeling, all suffering & stress will be exhausted.”‘ But when I said this, I did not see that the Niganthas had any legitimate defense of their teaching. “Such is the teaching of the Niganthas. And, such being the teaching of the Niganthas, ten legitimate deductions can be drawn that give grounds for censuring them. (1) “If beings experience pleasure & pain based on what was done in the past, then obviously the Niganthas have done bad things in the past, which is why they now feel such fierce, sharp, racking pains. (2) “If beings experience pleasure & pain based on the creative act of a supreme god, then obviously the Niganthas have been created by an evil supreme god, which is why they now feel such fierce, sharp, racking pains. (3) “If beings experience pleasure & pain based on sheer luck, then obviously the Niganthas have evil luck, which is why they now feel such fierce, sharp, racking pains. (4) “If beings experience pleasure & pain based on birth, then obviously the Niganthas have had an evil birth, which is why they now feel such fierce, sharp, racking pains. (5) “If beings experience pleasure & pain based efforts in the here-&-now, then obviously the Niganthas have evil efforts in the here-&-now, which is why they now feel such fierce, sharp, racking pains. (6) “If beings experience pleasure & pain based on what was done in the past, the Niganthas deserve censure. Even if not, they still deserve censure. (7) “If beings experience pleasure & pain based on the creative act of a supreme god, the Niganthas deserve censure. Even if not, they still deserve censure. (8) “If beings experience pleasure & pain based on sheer luck, the Niganthas deserve censure. Even if not, they still deserve censure. (9) “If beings experience pleasure & pain based on birth, the Niganthas deserve censure. Even if not, they still deserve censure. (10) “If beings experience pleasure & pain based efforts in the here-&-now, the Niganthas deserve censure. Even if not, they still deserve censure. “Such is the teaching of the Niganthas, monks. And, such being the teaching of the Niganthas, these ten legitimate deductions can be drawn that give grounds for censuring them. This is how striving is fruitless, how exertion is fruitless. “And how is striving fruitful, how is exertion fruitful? There is the case where a monk, when not loaded down, does not load himself down with pain, nor does he reject pleasure that accords with the Dhamma, although he is not fixated on that pleasure. He discerns that ‘When I exert a [physical, verbal, or mental] fabrication against this cause of stress, then from the fabrication of exertion there is dispassion. When I look on with equanimity at that cause of stress, then from the development of equanimity there is dispassion.’ So he exerts a fabrication against the cause of stress where there comes dispassion from the fabrication of exertion, and develops equanimity with regard to the cause of stress where there comes dispassion from the development of equanimity. Thus the stress where there comes dispassion from the fabrication of exertion is exhausted & the stress where there comes dispassion from the development of equanimity is exhausted. “In the same way, the monk, when not loaded down, does not load himself down with pain, nor does he reject pleasure that accords with the Dhamma, although he is not infatuated with that pleasure. He discerns that ‘When I exert a [physical, verbal, or mental] fabrication against this cause of stress, then from the fabrication of exertion there is dispassion. When I look on with equanimity at that cause of stress, then from the development of equanimity there is dispassion.’ So he exerts a fabrication against the cause of stress where there comes dispassion from the fabrication of exertion, and develops equanimity with regard to the cause of stress where there comes dispassion from the development of equanimity. Thus the stress where there comes dispassion from the fabrication of exertion is exhausted & the stress where there comes dispassion from the development of equanimity is exhausted. “Furthermore, the monk notices this: ‘When I live according to my pleasure, unskillful mental qualities increase in me & skillful qualities decline. When I exert myself with stress & pain, though, unskillful qualities decline in me & skillful qualities increase. Why don’t I exert myself with stress & pain?’ So he exerts himself with stress & pain, and while he is exerting himself with stress & pain, unskillful qualities decline in him, & skillful qualities increase. Then at a later time he would no longer exert himself with stress & pain. Why is that? Because he has attained the goal for which he was exerting himself with stress & pain. That is why, at a later time, he would no longer exert himself with stress & pain. “Suppose a fletcher were to heat & warm an arrow shaft between two flames, making it straight & pliable. Then at a later time he would no longer heat & warm the shaft between two flames, making it straight & pliable. Why is that? Because he has attained the goal for which he was heating & warming the shaft. That is why at a later time he would no longer heat & warm the shaft between two flames, making it straight & pliable. “In the same way, the monk notices this: ‘When I live according to my pleasure, unskillful mental qualities increase in me & skillful qualities decline. When I exert myself with stress & pain, though, unskillful qualities decline in me & skillful qualities increase. Why don’t I exert myself with stress & pain?’ So he exerts himself with stress & pain, and while he is exerting himself with stress & pain, unskillful qualities decline in him, & skillful qualities increase. Then at a later time he would no longer exert himself with stress & pain. Why is that? Because he has attained the goal for which he was exerting himself with stress & pain. That is why, at a later time, he would no longer exert himself with stress & pain. “This is how striving is fruitful, how exertion is fruitful. “Furthermore, there is the case where a Tathagata appears in the world, worthy and rightly self-awakened. 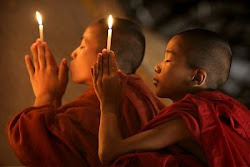 He teaches the Dhamma admirable in its beginning, admirable in its middle, admirable in its end. He proclaims the holy life both in its particulars and in its essence, entirely perfect, surpassingly pure. “When he has thus gone forth, endowed with the monks’ training & livelihood, then — abandoning the taking of life — he abstains from the taking of life. He dwells with his rod laid down, his knife laid down, scrupulous, merciful, compassionate for the welfare of all living beings. “Abandoning false speech, he abstains from false speech. He speaks the truth, holds to the truth, is firm, reliable, no deceiver of the world. “Abandoning abusive speech, he abstains from abusive speech. He speaks words that are soothing to the ear, that are affectionate, that go to the heart, that are polite, appealing and pleasing to people at large. “He abstains from wearing garlands and from beautifying himself with scents and cosmetics. “He abstains from accepting gold and money. “He abstains from accepting uncooked grain… raw meat… women and girls… male and female slaves… goats and sheep… fowl and pigs… elephants, cattle, steeds, and mares… fields and property. “He abstains from running messages… from buying and selling… from dealing with false scales, false metals, and false measures… from bribery, deception, and fraud. “He abstains from mutilating, executing, imprisoning, highway robbery, plunder, and violence. “On seeing a form with the eye, he does not grasp at any theme or details by which — if he were to dwell without restraint over the faculty of the eye — evil, unskillful qualities such as greed or distress might assail him. On hearing a sound with the ear… On smelling an odor with the nose… On tasting a flavor with the tongue… On touching a tactile sensation with the body… On cognizing an idea with the intellect, he does not grasp at any theme or details by which — if he were to dwell without restraint over the faculty of the intellect — evil, unskillful qualities such as greed or distress might assail him. Endowed with this noble restraint over the sense faculties, he is inwardly sensitive to the pleasure of being blameless. “When going forward and returning, he acts with alertness. When looking toward and looking away… when bending and extending his limbs… when carrying his outer cloak, his upper robe, and his bowl… when eating, drinking, chewing, and tasting… when urinating and defecating… when walking, standing, sitting, falling asleep, waking up, talking, and remaining silent, he acts with alertness. “Having abandoned these five hindrances — imperfections of awareness that weaken discernment — then, quite withdrawn from sensual pleasures, withdrawn from unskillful mental qualities, he enters and remains in the first jhana: rapture and pleasure born from withdrawal, accompanied by directed thought and evaluation. This, too, is how striving is fruitful, how exertion is fruitful. “Then, with the stilling of directed thoughts & evaluations, he enters and remains in the second jhana: rapture and pleasure born of composure, one-pointedness of awareness free from directed thought and evaluation — internal assurance. This, too, is how striving is fruitful, how exertion is fruitful. “Then, with the fading of rapture, he remains equanimous, mindful, & alert, and senses pleasure with the body. He enters & remains in the third jhana, of which the Noble Ones declare, ‘Equanimous & mindful, he has a pleasant abiding.’ This, too, is how striving is fruitful, how exertion is fruitful. “Then, with the abandoning of pleasure and pain — as with the earlier disappearance of elation and distress — he enters and remains in the fourth jhana: purity of equanimity and mindfulness, neither-pleasure-nor-pain. This, too, is how striving is fruitful, how exertion is fruitful. “With his mind thus concentrated, purified, and bright, unblemished, free from defects, pliant, malleable, steady, and attained to imperturbability, he directs and inclines it to knowledge of the recollection of past lives. He recollects his manifold past lives, i.e., one birth, two births, three births, four, five, ten, twenty, thirty, forty, fifty, one hundred, one thousand, one hundred thousand, many aeons of cosmic contraction, many aeons of cosmic expansion, many aeons of cosmic contraction and expansion, [recollecting], ‘There I had such a name, belonged to such a clan, had such an appearance. Such was my food, such my experience of pleasure and pain, such the end of my life. Passing away from that state, I re-arose there. There too I had such a name, belonged to such a clan, had such an appearance. Such was my food, such my experience of pleasure and pain, such the end of my life. Passing away from that state, I re-arose here.’ Thus he recollects his manifold past lives in their modes and details. This, too, is how striving is fruitful, how exertion is fruitful. “With his mind thus concentrated, purified, and bright, unblemished, free from defects, pliant, malleable, steady, and attained to imperturbability, he directs and inclines it to knowledge of the passing away and re-appearance of beings. He sees — by means of the divine eye, purified and surpassing the human — beings passing away and re-appearing, and he discerns how they are inferior and superior, beautiful and ugly, fortunate and unfortunate in accordance with their kamma: ‘These beings — who were endowed with bad conduct of body, speech, and mind, who reviled the noble ones, held wrong views and undertook actions under the influence of wrong views — with the break-up of the body, after death, have re-appeared in the plane of deprivation, the bad destination, the lower realms, in hell. But these beings — who were endowed with good conduct of body, speech, and mind, who did not revile the noble ones, who held right views and undertook actions under the influence of right views — with the break-up of the body, after death, have re-appeared in the good destinations, in the heavenly world.’ Thus — by means of the divine eye, purified and surpassing the human — he sees beings passing away and re-appearing, and he discerns how they are inferior and superior, beautiful and ugly, fortunate and unfortunate in accordance with their kamma. This, too, is how striving is fruitful, how exertion is fruitful. “With his mind thus concentrated, purified, and bright, unblemished, free from defects, pliant, malleable, steady, and attained to imperturbability, the monk directs and inclines it to the knowledge of the ending of the mental fermentations. He discerns, as it has come to be, that ‘This is stress… This is the origination of stress… This is the cessation of stress… This is the way leading to the cessation of stress… These are mental fermentations… This is the origination of fermentations… This is the cessation of fermentations… This is the way leading to the cessation of fermentations.’ His heart, thus knowing, thus seeing, is released from the fermentation of sensuality, the fermentation of becoming, the fermentation of ignorance. With release, there is the knowledge, ‘Released.’ He discerns that ‘Birth is ended, the holy life fulfilled, the task done. There is nothing further for this world.’ This, too, is how striving is fruitful, how exertion is fruitful. “Such is the teaching of the Tathagata. And, such being the teaching of the Tathagata, ten legitimate deductions can be drawn that give grounds for praising him. (1) “If beings experience pleasure & pain based on what was done in the past, then obviously the Tathagata has done good things in the past, which is why he now feels such pleasure free from fermentation. (2) “If beings experience pleasure & pain based on the creative act of a supreme god, then obviously the Tathagata has been created by an excellent supreme god, which is why he now feels such pleasure free from fermentation. (3) “If beings experience pleasure & pain based on sheer luck, then obviously the Tathagata has admirable luck, which is why he now feels such pleasure free from fermentation. (4) “If beings experience pleasure & pain based on birth, then obviously the Tathagata has had an admirable birth, which is why he now feels such pleasure free from fermentation. (5) “If beings experience pleasure & pain based efforts in the here-&-now, then obviously the Tathagata has admirable efforts in the here-&-now, which is why he now feels such pleasure free from fermentation. (6) “If beings experience pleasure & pain based on what was done in the past, the Tathagata deserves praise. Even if not, he still deserves praise. (7) “If beings experience pleasure & pain based on the creative act of a supreme god Tathagata deserves praise. Even if not, he still deserves praise. (8) “If beings experience pleasure & pain based on sheer luck, the Tathagata deserves praise. Even if not, he still deserves praise. (9) “If beings experience pleasure & pain based on birth, Tathagata deserves praise. Even if not, he still deserves praise. (10) “If beings experience pleasure & pain based efforts in the here-&-now, the Tathagata deserves praise. Even if not, he still deserves praise. Nigantha Nataputta: The leader of the Niganthas. Some of these are: CGIAR, FORD FOUNDATION [the same organisation that started the infamous Green Revolution in India], the front organisations of the Rockefeller and Rothschild banksters. Even the Organic Consumers’ Associations are funded by the same group of crooks. Organic Consumers Association Funded by Big Pharma! Our food supply is in jeopardy. Not only from outside forces such as poisons from China, but from within. The very people that we look to for guidance seem to be working together to lead us straight into global food governance in the form of Codex Alimentarius. This is especially alarming when you consider that the very organizations such as the USDA and FDA, that are charged with the safeguarding and regulation of our food supply are at the forefront of the battle, leading us straight into worldwide genocide using food as a weapon. But the USDA and FDA do not stand alone. There are others who consider food to be “fair game” in this war against the people, and they just happen to control some very large purse strings. So, who holds the purse strings behind the push to obliterate any food safeguards we may have? Let’s just pick two – Rockefeller and Merck, then take a closer look at a few of the “trusted” organizations that they fund. Let’s take a look at just a part of what the Rockefeller crime family is involved in concerning our food supply. Philanthropy can be used by business to advance a corporate image that is acceptable to certain groups of people in order to put up a benevolent facade while all the time conducting business as usual, which may or may not be so benevolent. Ven. Sariputta said: “All those who ask questions of another do so from any one of five motivations. Which five? Reading panevam-citto with the Thai edition. The PTS reading — pakuppanto citto, “with a provoked heart” — does not fit the context at all. Mr. B.L. Joshi this evening. It was a courtesy call. by the Hon’ble Chief Minister ji. medals in Asian Games, while Km. Alka Tomar, Ms. N.G. Sonia Chanu, Mr.
Chaudhary won medals in Commonwealth Games. laurels to the State and they would also be a source of inspiration for others. no dearth of talent in U.P. nor the sportspersons were weary of hard work. preparations for future sports competitions. programme and expressed his gratitude towards the guests. salute of the parade. Earlier, the Hon’ble Chief Minister Ms.
were also displayed on the occasion. presentations were highly appreciated by the spectators. presented the life of Lord Buddha and the places related with him. also participated in the programme. citizens were present on the occasion. 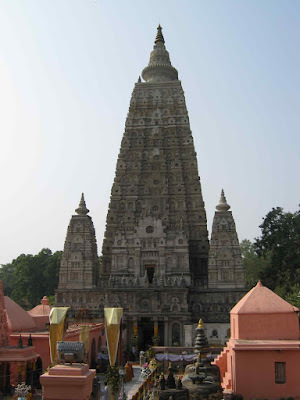 ABOVE: The west side of the Mahabodhi Temple, Bodhgaya, Bihar, India. 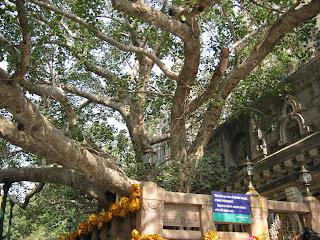 The Bodhi tree is on the east side and not visible in this photograph. ABOVE: The north side of the Bodhi tree on the eastern side of the Mahabodhi Temple, Bodhgaya, Bihar, India. 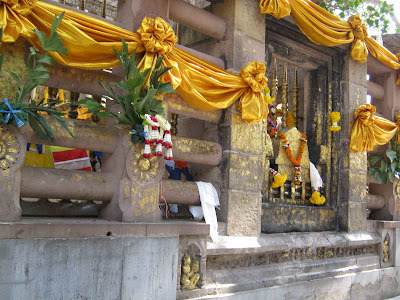 ABOVE: The railing on the east side of the Bodhi tree at the Mahabodhi Temple, Bodhgaya, Bihar, India. The Bodhi tree is behind this railing. Objectification = papañca. The tendency of the mind to proliferate issues from the sense of “self.” This term can also be translated as self-reflexive thinking, reification, falsification, distortion, elaboration, or exaggeration. In the discourses, it is frequently used in analyses of the psychology of conflict. The categories of objectification stem from the self-reflexive thought, “I am the thinker,” (see Sn 4.14), and include the categories of inappropriate attention (see MN 2): being/not-being, me/not-me, mine/not-mine, doer/done-to. The perceptions of objectification include such thoughts as “This is me. This is mine. This is my self.” These perceptions and categories turn back on the person who allows them to proliferate, giving rise to internal conflict & strife, which then expand outward. For more on these terms, see MN 18. ABOVE: Display of Lord Buddha’s relics in the Minor Antiquities Annex at the India Museum, Kolkata. 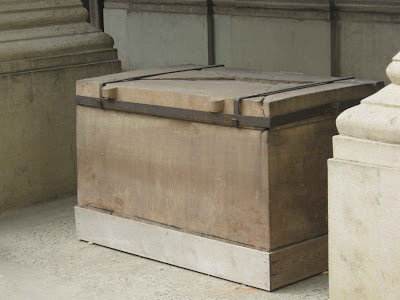 The relics are visible and contained in a small pottery container. 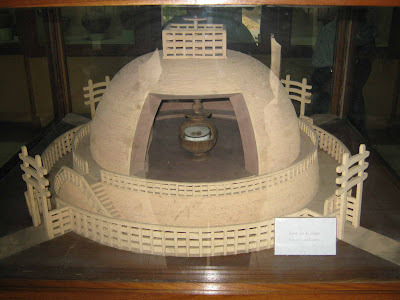 The surrounding structure appears to be a scale model of an ancient stupa that may have existed at the time of Asoka. 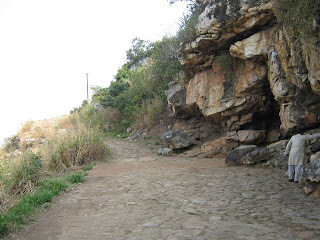 ABOVE: The path leading up to Dungeshwara Cave. You can see the some of the beggars waiting for pilgrims and the temple at the site of the cave (white colour building in the centre of the photo). 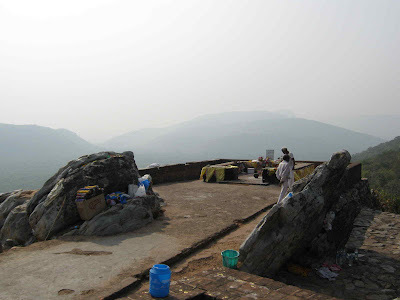 ABOVE: The veranda outside the Dungeshwara Cave. 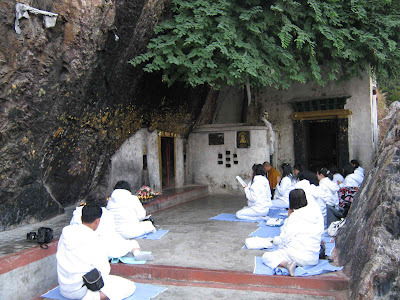 I was told the cave itself is the rectangular opening on the left in between the two groups of Thai chanter pilgrims. 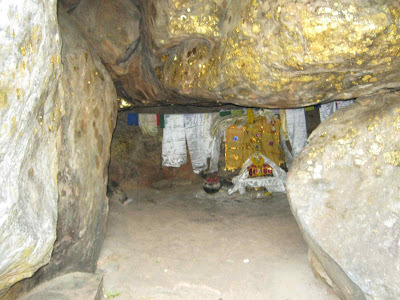 ABOVE: The Indasala Cave, 7km east of Rajgir (Raajagaha). The cave is the dark spot in the centre of the photo. The other dark spot on the left centre is a crack in the rock and not a cave. 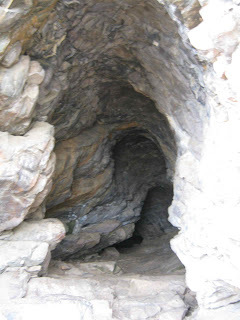 ABOVE: Looking out from the entrance to Indasala Cave. 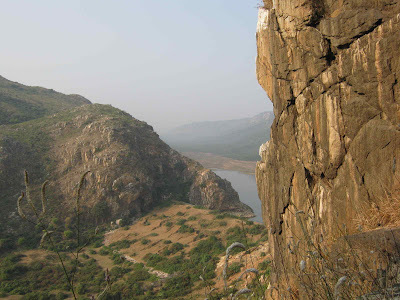 ABOVE: A view looking south west from Indasala Cave. 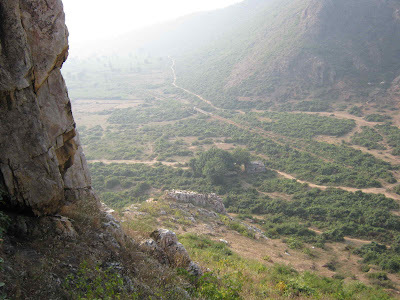 ABOVE: A view looking south east from Indasala Cave. The car and a small neglected Hindu temple is behind the clump of trees in the lower centre of the photo. 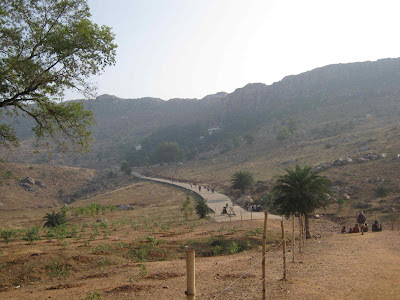 ABOVE: A view looking south at Venavana, Rajgir, Bihar, India. 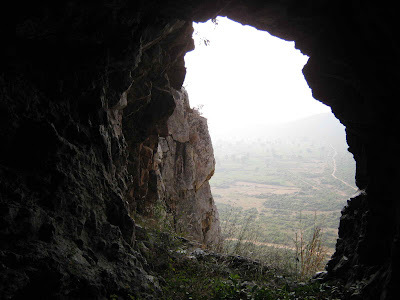 ABOVE: A view looking east at Sattapana Cave, Rajgir, Bihar, India. 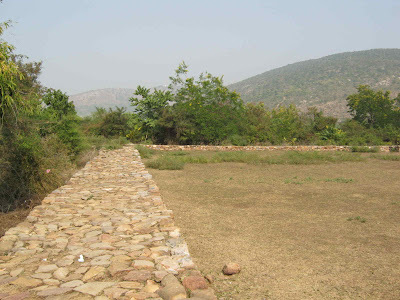 ABOVE: The supposed site of King Bimbisaara’s Goal, Rajgir, Bihar, India. 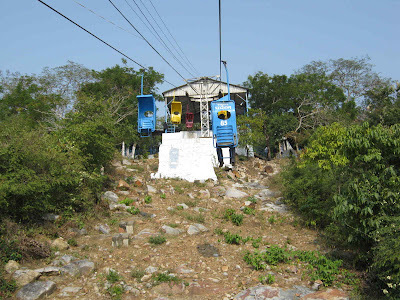 ABOVE: The chair lift going up to the Japanese Stupa and Gijjhakuta, Rajgir, Bihar, India. 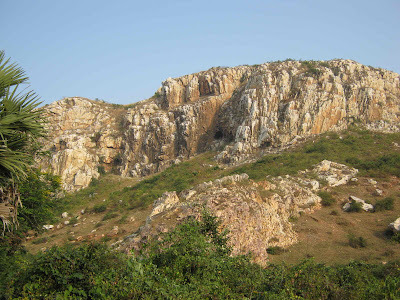 ABOVE: One of the plat forms at Gijjhakuta, Rajgir, Bihar, India. 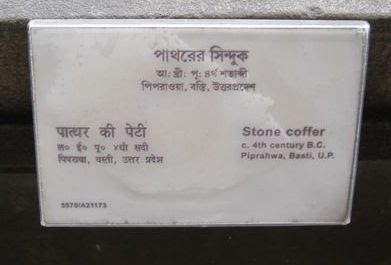 This location has the remains of several kutis used by ascetics in the past 2500 years. This location in the photo had the most ribbons, gold film, scarves, candles and incense etc. That doesn’t necessarily mean it was the precise location of Lord Buddha’s kuti. The local men were there to sell water, incense and other paraphernalia. 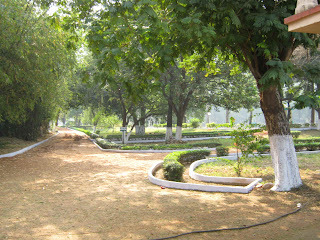 The grounds of the original palace in Lumbini, Nepal, where Buddha’s family lived. The World Peace Pagoda built by the Japanese near Vulture’s Peak, Rajgir in Bihar, where Buddha delivered his second sermon. 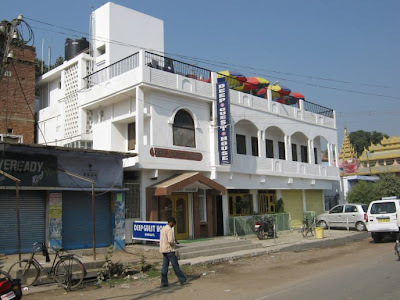 The Mahabodhi temple at Budhgaya in Bihar is popular with pilgrims. The reclining Buddha at Kushinagar. The Matha Kuar Shrine at Kushinagar where Buddha is believed to have breathed his last. The Mahaparinirvana stupa at Kushinagar. The pavilion sheltering the Goddess of Mercy which was lit up at night. “Monks, there are these three topics for discussion. Which three? “Monks, it’s through his way of participating in a discussion that a person can be known as fit to talk with or unfit to talk with. If a person, when asked a question, doesn’t give a categorical answer to a question deserving a categorical answer, doesn’t give an analytical (qualified) answer to a question deserving an analytical answer, doesn’t give a counter-question to a question deserving a counter-question, doesn’t put aside a question deserving to be put aside, then — that being the case — he is a person unfit to talk with. But if a person, when asked a question, gives a categorical answer to a question deserving a categorical answer, gives an analytical answer to a question deserving an analytical answer, gives a counter-question to a question deserving a counter-question, and puts aside a question deserving to be put aside, then — that being the case — he is a person fit to talk with. “Monks, it’s through his way of participating in a discussion that a person can be known as fit to talk with or unfit to talk with. If a person, when asked a question, doesn’t stand by what is possible and impossible, doesn’t stand by agreed-upon assumptions, doesn’t stand by teachings known to be true, doesn’t stand by standard procedure, then — that being the case — he is a person unfit to talk with. But if a person, when asked a question, stands by what is possible and impossible, stands by agreed-upon assumptions, stands by teachings known to be true, stands by standard procedure, then — that being the case — he is a person fit to talk with. “Monks, it’s through his way of participating in a discussion that a person can be known as fit to talk with or unfit to talk with. If a person, when asked a question, wanders from one thing to another, pulls the discussion off the topic, shows anger & aversion and sulks, then — that being the case — he is a person unfit to talk with. But if a person, when asked a question, doesn’t wander from one thing to another, doesn’t pull the discussion off the topic, doesn’t show anger or aversion or sulk, then — that being the case — he is a person fit to talk with. “Monks, it’s through his way of participating in a discussion that a person can be known as fit to talk with or unfit to talk with. If a person, when asked a question, puts down [the questioner], crushes him, ridicules him, grasps at his little mistakes, then — that being the case — he is a person unfit to talk with. But if a person, when asked a question, doesn’t put down [the questioner], doesn’t crush him, doesn’t ridicule him, doesn’t grasp at his little mistakes, then — that being the case — he is a person fit to talk with. “Monks, it’s through his way of participating in a discussion that a person can be known as drawing near or not drawing near. One who lends ear draws near; one who doesn’t lend ear doesn’t draw near. Drawing near, one clearly knows one quality, comprehends one quality, abandons one quality, and realizes one quality. Clearly knowing one quality, comprehending one quality, abandoning one quality, and realizing one quality, one touches right release. For that’s the purpose of discussion, that’s the purpose of counsel, that’s the purpose of drawing near, that’s the purpose of lending ear: i.e., the liberation of the mind through no clinging. don’t speak in that way. and not disparage what’s not. don’t grasp at little mistakes. That’s the noble ones’ counsel. ’ble Chief Minister of Uttar Pradesh Ms. Mayawati ji has extended her heartiest greetings and good wishes to thepeople of the State on occasion of 61th anniversary of the Republic Day. th January was a day to remember and pay homage to all known and unknownmartyrs and freedom fighters, who laid down their lives forachieving freedom. She said that because of their supremeefforts, today we are citizens of a free country. ’ble Chief Minister ji further said that it was also a day to pay tributes to the heroes of social change, whofought for the rights of the exploited, deprived and SC/STsections of the society. They also waged battle against a socialsystem based on inequality and always fought to establish egalitarian society. ’ble Chief Minister ji said that the Republic Day was also an occasion to introspect how far we succeeded inenforcing the provisions of the Indian Constitution. [The Buddhist Circle] Re: Happy Constitution Day! Wish you all Happy Constitution Day. [mfc_mumbai] My heartiest best wishes to all fellow Indians on occassion of 62nd Republic Day of “The Republic Of India”. My heartiest best wishes to all fellow Indians on occassion of 62nd Republic Day of “The Republic Of India”. The freedom that we celebrate on Republic Day is the liberty to rule ourselves under a Constitution that we have created; one which safeguards our rights and allows us to be good citizens while not trampling over the rights of others. “Walter Bagehot defined democracy as ‘Government by discussion’. Abraham Lincoln defined democracy as ‘ A Government of the people, by the people and for the people’. This discourse plays a central role in the early Buddhist analysis of conflict. As might be expected, the blame for conflict lies within, in the unskillful habits of the mind, rather than without. The culprit in this case is a habit called papañca. Unfortunately, none of the early texts give a clear definition of what the word papañca means, so it’s hard to find a precise English equivalent for the term. However, they do give a clear analysis of how papañca arises, how it leads to conflict, and how it can be ended. In the final analysis, these are the questions that matter — more than the precise definition of terms — so we will deal with them first before proposing a few possible translation equivalents for the word. Dependent on eye & forms, eye-consciousness arises [similarly with the rest of the six senses]. The meeting of the three is contact. With contact as a requisite condition, there is feeling. Based on what a person papañcizes, the perceptions & categories of papañca assail him/her with regard to past, present, & future forms cognizable via the eye [as with the remaining senses]. What are these perceptions & categories that assail the person who papañcizes? Sn 4.14states that the root of the categories of papañca is the perception, “I am the thinker.” From this self-reflexive thought — in which one conceives a “self,” a thing corresponding to the concept of “I” — a number of categories can be derived: being/not-being, me/not-me, mine/not-mine, doer/done-to, signifier/signified. Once one’s self becomes a thing under the rubric of these categories, it’s impossible not to be assailed by the perceptions & categories derived from these basic distinctions. When there’s the sense of identification with something that experiences, then based on the feelings arising from sensory contact, some feelings will seem appealing — worth getting for the self — and others will seem unappealing — worth pushing away. From this there grows desire, which comes into conflict with the desires of others who are also engaging in papañca. This is how inner objectifications breed external contention. How can this process be ended? Through a shift in perception, caused by the way one attends to feelings, using the categories of appropriate attention [see MN 2]. As the Buddha states in DN 21, rather than viewing a feeling as an appealing or unappealing thing, one should look at it as part of a causal process: when a particular feeling is pursued, do skillful or unskillful qualities increase in the mind? If skillful qualities increase, the feeling may be pursued. If unskillful qualities increase, it shouldn’t. When comparing feelings that lead to skillful qualities, notice which are more refined: those accompanied with thinking (directed thought) and evaluation, or those free of thinking and evaluation, as in the higher stages of mental absorption, or jhana. When seeing this, there is a tendency to opt for the more refined feelings, and this cuts through the act of thinking that, according to MN 18, provides the basis for papañca. In following this program, the notion of agent and victim is avoided, as is self-reflexive thinking in general. There is simply the analysis of cause-effect processes. One is still making use of dualities — distinguishing between unskillful and skillful (and affliction/lack of affliction, the results of unskillful and skillful qualities) — but the distinction is between processes, not things. Thus one’s analysis avoids the type of thinking that, according toDN 21, depends on the perceptions and categories of papañca, and in this way the vicious cycle by which thinking and papañca keep feeding each other is cut. Ultimately, by following this program to greater and greater levels of refinement through the higher levels of mental absorption, one finds less and less to relish and enjoy in the six senses and the mental processes based on them. With this sense of disenchantment, the processes of feeling and thought are stilled, and there is a breakthrough to the cessation of the six sense spheres. When these spheres cease, is there anything else left? Ven. Sariputta, in AN 4.174, warns us not to ask, for to ask if there is, isn’t, both-is-and-isn’t, neither-is-nor-isn’t anything left in that dimension is to papañcize what is free from papañca. However, this dimension is not a total annihilation of experience. It’s a type of experience that DN 11 calls consciousness without feature, luminous all around, where water, earth, fire, & wind have no footing, where long/short, coarse/fine, fair/foul, name/form are all brought to an end. This is the fruit of the path of arahantship — a path that makes use of dualities but leads to a fruit beyond them. It may come as cold comfort to realize that conflict can be totally overcome only with the realization of arahantship, but it’s important to note that by following the path recommended in DN 21 — learning to avoid references to any notion of “self” and learning to view feelings not as things but as parts of a causal process affecting the qualities in the mind — the basis for papañca is gradually undercut, and there are fewer and fewer occasions for conflict. In following this path, one reaps its increasing benefits all along the way. Translating papañca: As one writer has noted, the word papañca has had a wide variety of meanings in Indian thought, with only one constant: in Buddhist philosophical discourse it carries negative connotations, usually of falsification and distortion. The word itself is derived from a root that means diffuseness, spreading, proliferating. The Pali Commentaries define papañca as covering three types of thought: craving, conceit, and views. They also note that it functions to slow the mind down in its escape from samsara. Because its categories begin with the objectifying thought, “I am the thinker,” I have chosen to render the word as “objectification,” although some of the following alternatives might be acceptable as well: self-reflexive thinking, reification, proliferation, complication, elaboration, distortion. The word offers some interesting parallels to the postmodern notion of logocentric thinking, but it’s important to note that the Buddha’s program of deconstructing this process differs sharply from that of postmodern thought. I have heard that on one occasion the Blessed One was living among the Sakyans nearKapilavatthu in the Banyan Park. Then in the early morning, having put on his robes and carrying his bowl & outer robe, he went into Kapilavatthu for alms. Having gone for alms in Kapilavatthu, after the meal, returning from his alms round, he went to the Great Wood for the day’s abiding. Plunging into the Great Wood, he sat down at the root of a bilva sapling for the day’s abiding. “If, monk, with regard to the cause whereby the perceptions & categories of objectification assail a person, there is nothing there to relish, welcome, or remain fastened to, then that is the end of the obsessions of passion, the obsessions of resistance, the obsessions of views, the obsessions of uncertainty, the obsessions of conceit, the obsessions of passion for becoming, & the obsessions of ignorance. That is the end of taking up rods & bladed weapons, of arguments, quarrels, disputes, accusations, divisive tale-bearing, & false speech. That is where these evil, unskillful things cease without remainder.” That is what the Blessed One said. Having said it, the One Well-gone got up from his seat and went into his dwelling. “As you say, friend,” the monks responded. “Dependent on eye & forms, eye-consciousness arises. The meeting of the three is contact. With contact as a requisite condition, there is feeling. What one feels, one perceives (labels in the mind). What one perceives, one thinks about. What one thinks about, one objectifies. Based on what a person objectifies, the perceptions & categories of objectification assail him/her with regard to past, present, & future forms cognizable via the eye. “Dependent on intellect & ideas, intellect-consciousness arises. The meeting of the three is contact. With contact as a requisite condition, there is feeling. What one feels, one perceives (labels in the mind). What one perceives, one thinks about. What one thinks about, one objectifies. Based on what a person objectifies, the perceptions & categories of objectification assail him/her with regard to past, present, & future ideas cognizable via the intellect. “Now, when there is the eye, when there are forms, when there is eye-consciousness, it is possible that one will delineate a delineation of contact. When there is a delineation of contact, it is possible that one will delineate a delineation of feeling. When there is a delineation of feeling, it is possible that one will delineate a delineation of perception. When there is a delineation of perception, it is possible that one will delineate a delineation of thinking. When there is a delineation of thinking, it is possible that one will delineate a delineation of being assailed by the perceptions & categories of objectification. “When there is the intellect, when there are ideas, when there is intellect-consciousness, it is possible that one will delineate a delineation of contact. When there is a delineation of contact, it is possible that one will delineate a delineation of feeling. When there is a delineation of feeling, it is possible that one will delineate a delineation of perception. When there is a delineation of perception, it is possible that one will delineate a delineation of thinking. When there is a delineation of thinking, it is possible that one will delineate a delineation of being assailed by the perceptions & categories of objectification. “Now, when there is no eye, when there are no forms, when there is no eye-consciousness, it is impossible that one will delineate a delineation of contact. When there is no delineation of contact, it is impossible that one will delineate a delineation of feeling. When there is no delineation of feeling, it is impossible that one will delineate a delineation of perception. When there is no delineation of perception, it is impossible that one will delineate a delineation of thinking. When there is no delineation of thinking, it is impossible that one will delineate a delineation of being assailed by the perceptions & categories of objectification. “When there is no intellect, when there are no ideas, when there is no intellect-consciousness, it is impossible that one will delineate a delineation of contact. When there is no delineation of contact, it is impossible that one will delineate a delineation of feeling. When there is no delineation of feeling, it is impossible that one will delineate a delineation of perception. When there is no delineation of perception, it is impossible that one will delineate a delineation of thinking. When there is no delineation of thinking, it is impossible that one will delineate a delineation of being assailed by the perceptions & categories of objectification. That is what the Blessed One said. Gratified, Ven. Ananda delighted in the Blessed One’s words. The artificiality of this phrase — “delineate a delineation” — seems intentional. It underlines the artifice implicit in the process by which the mind, in singling out events, turns them into discrete things. AN 3.67; AN 3.72; AN 5.159. See also: DN 21; AN 3.72; Sn 4.8. “It’s not easy to teach the Dhamma to others, Ananda. The Dhamma should be taught to others only when five qualities are established within the person teaching. Which five? According to the Commentary, “hurting oneself” means exalting oneself. “Hurting others” means putting other people down. See also: (the Buddha’s answer to Subhadda’s question); MN 18; AN 3.67; AN 3.72; AN 5.159. (the Buddha’s answer to Subhadda’s question. to be free from clinging, we must be free from greed. Fourth, to support our life, we take this food. Fifth, to attain our way, we take this food.